Naegi and his fellow classmates are initially ecstatic to be chosen to study at this prestigious institution, but these feelings of happiness are short-lived. They are soon confronted by Monokuma, the principal and resident bear, who traps them inside the school. The pupils' hopes of escape and graduation hinge on one of them successfully murdering one of their peers without being discovered. However, if the killer is caught, he or she will be executed, and the remaining survivors will be left to continue the deathmatch until only a single victor remains. Episode 1 was previewed at a screening in TOHO Cinema Roppongi Hills, Tokyo on June 23, 2013. Regular broadcasting began on July 5, 2013. Due to the success of the Danganronpa games, various spin-offs on a variety of media were made including the anime adaption and Danganronpa/Zero, a series of two novels written by Tsuyoshi Kodakazu and illustrated by Rui Komatsuzaki which were released on September 15, 2011 and October 13, 2011. This is the perfect example of a video game adaptation done wrong. Trying to fit in about 25 hours of material into 13 episodes is NOT a good idea, unless you want an extremely rushed show with very flat characters. It is horrible. The story was actually pretty decently adapted. While it was rushed, nothing very important was omitted. However, I have some issues with the investigations. How do you expect anime watchers to identify the culprit if the most important part in mystery solving is rushed in about 3 minutes? Rushed investigations also made it seem like Kirigiri and Naegi were pulling things out of their asses during trials. That is another thing : class trials. There were 13 people in the first class trial. Everyone had to speak at least once, right? So, once again, the actual mystery solving part was rushed. Though, as the show went on, there were fewer students, so the trials did not feel as rushed (chapter 4 and chapter 5's trials are the best examples.) Still, this just proves 13 episodes only was not enough. Next is the art. The character design is very odd, but it makes the characters look colorful and very different from one another! You could pretty much tell who had what talent just by looking at their appearance. Komatsuzaki Rui really has not dropped the ball design-wise. However, the animation quality was quite subpar. Some episodes had okay animation, some terrible. The amount of stills also hurts, but it is acceptable. Generally, class trials had good animation, but the rest (investigation and the pre-investigation segments) took a huge hit. I like how they kept Monokuma's small quirks in the background, though. Like eating pancakes after a particular execution. Another good thing is the soundtrack. Composed by Takada Masafumi, the music is very catchy and really sets in the mood in most scenes. A prime example is the song named "DISTRUST" playing during big revelations, absolutely perfect! I don't dislike the OP theme, but the game's is way better. The ED, however, is pretty awesome. Personally, I love the 8-bit part at the beginning. The voice acting is very well done, as expected of big name seiyuus. Monokuma's especially is perfect for the role. Now here comes the bad part of the anime, and the main reason why I did not enjoy the show as many as I thought I would : character. In the game, characters are mainly developed by hanging out with them. As you hang out with them, you learn more about them. That is where they get development, and since the anime completely skips hanging out, there is nearly no character development for the whole cast, with the exception of Kirigiri, Togami and, to some degree, Naegi. This is a bad thing because when a character dies, it is hard to feel anything because you could not get attached to them. And that makes some twists feel pretty underwhelming. In the end, the Danganronpa anime had a few good things about it, but it was severely crippled by a lack of character development and a very limited number of episodes. And that is why I did not enjoy the anime very much. First off, if you detest/abhor/dislike this anime, read no further. I've just seen many overly-negative reviews and wanted to have an alternate opinion available for anyone who needs one. This is also a very naive review, as I've never played the game, nor have heard of its popularity, so expectations were average. Oh god, what am I getting myself into? "The people around me and the events that occur are very peculiar, but interesting!" Character: 10/10. Ahh, I see now. So the characters are extremely unique (and contrast each other perfectly), I mean, a Super Duper High School Level Wrestler that looks like a body-building man but is really a girl?! My brain was surprised and I'd imagine it started seeping out of my nose. But nonetheless, the characters (obviously) really made the show for me. Not a single character in the show can be labeled, by me, a bad character. Hell, I might just start a new list for Most Hated Characters just because of Monokuna. So I think it's safe to say that you'll enjoy the characters. Consistency: 7/10. Alright, this is the one thing that got on my nerves. The series did tend to be quite episodic at times and left important information out as well. That was a big downer for me as well, because to me, the series could've been almost nearly perfect if it didn't just drop information. However, I do understand that this was a seasonal anime, a Summer seasonal to be exact, so there really wasn't a way to break out of 12-13 episodes. Long story short, this anime would've been awesome if it was a few episodes longer to include all the information. "But remember, there's always some other great things that we have as well. Trust me, I'm a fortune-teller. *wink*"
Thank you for the information and for creeping me out, Yasuhiro. But this holds true as well. For example: Mystery! The mystery in this series is absolutely top-notch and very invigorating (and this is coming from a HUGE Higurashi no Naku Koro ni fan), and almost always kept me anxious and nervous until they were solved. The prime example of this was the Classroom Trials, which was the highlight of the series for me. Sure, some of them were rushed, but quite honestly, who cares?! It was so exciting when I saw the elevator descending to the Classroom Trials room. The folowing debate would be very interesting, and was extremely interesting to see how each student used evidence to support themselves and to attack others. I must say, it was a bunch of fun. "You've got that wrong! Those trials were always difficult and were almost always put on my shoulders!" True, Naegi, but that bullet thing you did was always really cool. Okay, stop interrupting me, I'm trying to write a review. There is one more complaint I have of this series. The constant 'yadda yadda Despair blah Despair-filled bluh bluh Despair' dialogue was WAY overused, and it's very evident near the end. I mean, my god, I understand this is about despair, it's in the freaking title! The show just crammed that down my throat until I felt that was the only word I knew anymore. However, I did feel like I was reading a well-drafted essay, because I noticed a sequential tone structure, with a very strong tonal shift. Although this might not be very useful for anyone nor will you care,but I thought it was worth mentioning in case others noticed it as well. VA's 10/10: The voice actors in this series seemed like they were MOLDED to be perfect for each character. I couldn't see any character any other way. Even at first, I couldn't stand Monokuna's voice, but it grew on me fairly quickly. You could play any character's voices and I could deduce them almost immediately, they are THAT distinct. also created a great soundtrack for this anime (I mean, he DID get chosen to do music composition for Super Smash Bros. Brawl) and the mood was always enhanced when the music started up. The ED (Episode 13's was great), however, didn't really do it for me. It contrasted with the feel of the series (somewhat like "Torch" from Clannad: After Story), so it was a slight mood killer, but it wasn't too bad, because it was still a great song. Wow, you feeling okay Naegi? That's the first time I've heard you agree! "I just express my emotions enthusiastically and raw." ...that gave me a weird image. Enjoyment: 9/10. Yes, I loved this series. I had a great time and an exciting time watching it. If it was slightly longer and didn't try to implant the word "Despair" on me and shove it down my esophagus, I would've loved it just that much more. Yet again, this is completely my opinion, so please don't take any of my ramblings too hard. I also won't go over the story because everyone will have contrasting beliefs on it, so there really is no point. Thank you Naegi and Yasuhiro for the commentary on my review. Now get out of here and live on in despair. Personal Note: I watched the last 7 episodes while having a high fever and it made me feel a lot better by just watching it, so this may have a slightly higher score than it would've, but, I digress. I think it should be a general rule that if you're going to adapt any type of game, that you cannot make it 1-cour. If Danganronpa isn't a prime example of this rule, than I don't know what is. Being a fan of the game, I was very excited to hear that Danganronpa was receiving an adaption. The biggest issue though was 13 episodes - which, considering that Danganronpa relies a lot on character and plot development for it to work so well, was obviously going to be a huge let down in the series. Even as a standalone anime, Danganronpa doesn't work as well as it could've. The series revolves around 15 high school students, chosen to go to an academy of hope - Hope's Peak Academy - based on one major thing they excel in, be it detective work, fortune telling, anything really. I won't get into detail about the story, since well, there is a synopsis, but the words "15 high school students" and "13 episodes" should already start sounding alarms for you. Why? Because the show obviously doesn't have time to explore all of these characters, which is honestly a shame. The characters, honestly, come off as very one-dimensional and underdeveloped due to how quickly the pace moves. Characters that were supposed to have spent lots of time and have connections with Naegi, our main protagonist, are severely cut back which makes the murders all look like petty shock value. One thing I have always praised Danganronpa for was its excellent characters, which are almost completely butchered in the anime. The amount of foreshadowing and interactions that they all had was amazing, but in the anime, again, even as a standalone, is just very flat. Obviously, the characters who survive longer get more development, but without any actual character development or depth given to them, the entire impact of the death, trial, and executions are just.. gone. It makes it seem like just another petty death game, which unfortunately, is what the anime feels like. The story itself suffers due to rushed time as well, since again, the rushed pace takes away from a lot of foreshadowing that tie in to key events, most specifically a major plot twist near the end of the show. The story is pretty coherent and easy to follow, but in the end it never comes off as more than just mediocre due to how the anime is presented. Not to mention, so many things come off as complete asspulls. This is really present in the trials because of how short the investigations are. It makes it seem like some of the conclusions and accusations are just pulled out of nowhere for convenience. Important points that come up later on just feel extremely forced, and the drama that occurs as well feels too melodramatic due to lack of time spent in the setting and characters. It's all just a very overall rushed and messy anime. I both give credit and displeasure towards the artwork of the anime. I give credit to them for staying true to the character designs, actions, and sprites that were in the game. But my displeasure leads towards both the overall animation and the executions. The studio, Lerche, is a studio that has done hardly any actual anime and their lack of budget is very obvious, especially in the early episodes. It's also noticeable when you realize that a lot of animated scenes in the game, the executions obviously, are just traced over. Literally. I mean, good, I'm glad you tried THAT hard to stay true to the game, but that's just lazy when you have to trace over this. Not to mention the entire anime feels far too.. game like. As if the studio didn't know if they were making an anime or a game with more movements. The opening song is honestly a pretty generic rap song, and changes at odd times. The OST, while excellent in the game, doesn't seem to be as fitting in the anime? It's hard to describe, really, but it just doesn't feel right, though that could just be me. I do, however, appreciate all the VAs, namely Junko's, for their excellent job on the characters. The ED theme is also very well-done as well, and a very catch tune. To be honest, I'd find it very hard for one to genuinely enjoy Danganronpa if they haven't previously played the game. The immense flaws in the characters and storytelling is just so obvious, though then again if you're into just overall death game anime, then you may like this. Most of my enjoyment simply came from seeing all my favorite characters animated, though obviously if you haven't read the LP or played the game, you won't have that in it for you. Overall, Danganronpa shows exactly what is wrong with game to anime adaptions - cut time for key things like the characters and plot can really break a show, especially one that relies purely on that. If I were to recommend Danganronpa to someone, I'd recommend the translated game or the Let's Play any day. If you've already watched the anime and happened to like it, definitely go for one of the following, because the depth it goes into is quite amazing. If you wanted more out of the anime, then again, go for the LP or game. It's actually coming out for PS Vita come 2014, so if you get the chance, perhaps even buy it. Also, the end of the 13th episode hints at Super Danganronpa 2, the sequel to Danganronpa, being animated. Essentially, if this gets greenlit for an anime and is only 13 episodes and you're interested in it, don't bother. SDR2 can and will only work as 2-cour. I'd honestly recommend it either way since it answers many questions that Danganronpa had left behind. I sure as hell got my fill of despair from this, but not in the way I wanted to.. This review is based solely on the anime. 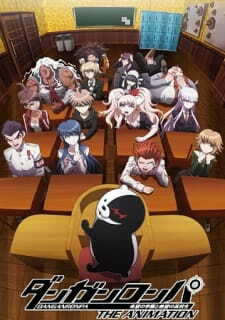 Former players of the murder mystery video game, Danganronpa: Academy of Hope and High School Students of Despair, are likely to find this adaptation as a disappointment with several changes or downgrades in the characters. Unfortunately, it does not differ much for someone who is unfamiliar with the game either. Danganronpa has an interesting plot with its dangerous game and potential to conduct an excellent thriller. However, you can imagine how well this murder mystery goes with only 13 episodes. Danganronpa’s motive was to create a horrifying show with gruesome deaths, but it embarrassed itself with its unpleasant artwork. The rushed pacing left no room to learn about the characters or give them time to develop. With a complex game such as Danganronpa, 13 episodes was a bad idea and left many plotholes. Danganronpa started off on a good note, introducing the characters and the survival game to consist of one winner. The execution is poor. A murder case lasts only 2 episodes, so it doesn’t hesitate in getting to the point or wastes time with sob stories from each character. Cases gets unbearably cheesy when the gullible and disinteresting male protagonist Naegi gains the spotlight by being the only one finding flaws in someone else’s theory. Danganronpa drifts away from the horror aspect with occasional changes in the rules. They use fanservice as a distraction once the story actually gets serious. A downside for the viewers who are solely interested in discovering which student is clever enough to conduct a murder and get away with it are likely to be disappointed with the ending. Of course, with a murder mystery also comes relevant questions of the game’s originality. This creates a rushed pacing in an attempt to answer every single question but leaves several plotholes and ridiculous outcomes. The idea of a menacing teddy bear named Monobear as the mastermind is not bad, considering that he proved himself to be a threatening individual. However, Danganronpa became less of a thriller as Monobear's personality occasionally became laidback and panicky. The high schoolers had diverse personalities, including a bipolar chick and the manliest looking girl, and the potential to be likeable characters. Sadly, Danganronpa reveals nothing about the characters besides their name and given nickname. Naegi even lacks any background, so his personality leaves him as no one but another cliché male protagonist. Mainly all, except 2 or 3 side characters, are just there to die or be present as an investigator. The elimination of characters continues without revealing anything about them until the very last minute, and there is hardly any time to feel sympathy for the dead or understand a character's motives. This leaves some questions unanswered, causes disappointments from misleads, and creates a strong lack of character development. The art is indeed unique but mostly awful. Most animation from game adaptations hide the fact they base from a game by fitting close to an anime as possible, but Danganronpa makes it extremely obvious with the arcade-animated scenes. Danganronpa supposedly is a horror. Admittedly, the combination of eerie music and sketched dead bodies makes it a bit terrifying, but how do they ruin it? Magenta blood. Slice the characters’ bodies in half, and you’ll find veins of playful colors. Also, the 3D elements could be cool, but it is more of a sneaky way to censor the deaths. No complaints about the character design, because it was really diverse and suited each character's personality. Oddly, Danganronpa is the first anime I’ve known to have a rap song as the OP. It’s not bad, and the lyrics relate to the show quite well. The ending is an arcade song that is questionable. The seiyuu fit the anime perfectly as each character had their own personality. The characters were diverse and included a manly female, great detective, and a bipolar chick. The seiyuu did an excellent job portraying those characters, especially the one who played Monobear. Danganronpa could be a better show if it wasn’t so rushed, paid more attention to the characters, and perhaps followed through with the game. I suggest watching it through the first murder case to decide whether you want to continue or not. Regardless, go into this with no high expectations or play the game as most game players suggested. When our protagonists in these Survival Anime are thrust into extreme - often life-or-death situations - we get to see desperate fights for survival and morals being put to the test. Any fan of the survival genre needs to check this list out!